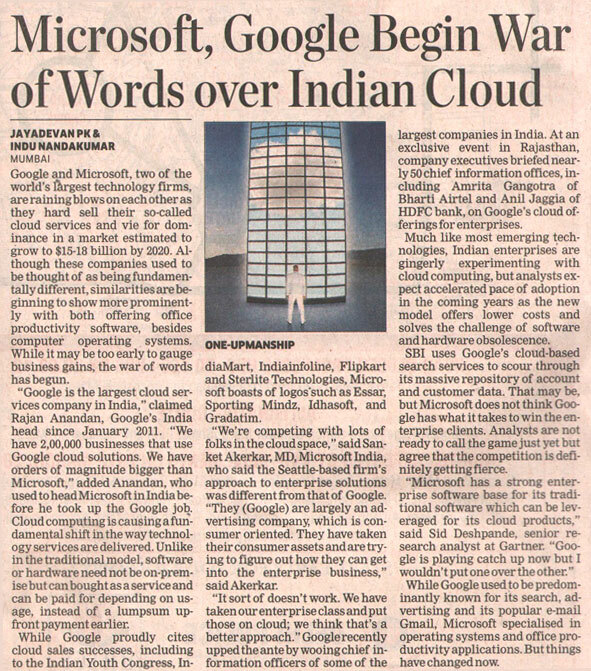 MUMBAI: Google and Microsoft, two of the world’s largest technology firms, are raining blows on each other as they hard sell their so-called cloud services and vie for dominance in a market estimated to grow to $15-18 billion by 2020. Although these companies used to be thought of as being fundamentally different, similarities are beginning to show more prominently with both offering office productivity software, besides computer operating systems. While it may be too early to gauge business gains, the war of words has begun. “Google is the largest cloud services company in India,” claimed Rajan Anandan, Google’s India head since January 2011. “We have 2,00,000 businesses that use Google cloud solutions. We have orders of magnitude bigger than Microsoft,” added Anandan, who used to head Microsoft in India before he took up the Google job. Cloud computing is causing a fundamental shift in the way technology services are delivered. Unlike in the traditional model, software or hardware need not be on-premise but can bought as a service and can be paid for depending on usage, instead of a lumpsum upfront payment earlier. While Google proudly cites cloud sales successes, including to the Indian Youth Congress, IndiaMart, Indiainfoline, Flipkart and Sterlite Technologies, Microsoft boasts of logos such as Essar, Sporting Mindz, Idhasoft, and Gradatim. “We’re competing with lots of folks in the cloud space,” said Sanket Akerkar, MD, Microsoft India, who said the Seattle-based firm’s approach to enterprise solutions was different from that of Google. “They (Google) are largely an advertising company, which is consumer oriented. They have taken their consumer assets and are trying to figure out how they can get into the enterprise business,” said Akerkar. “It sort of doesn’t work. We have taken our enterprise class and put those on cloud; we think that’s a better approach.” Google recently upped the ante by wooing chief information officers of some of the largest companies in India. At an exclusive event in Rajasthan, company executives briefed nearly 50 chief information offices, including Amrita Gangotra of Bharti Airtel and Anil Jaggia of HDFC bank, on Google’s cloud offerings for enterprises. Much like most emerging technologies, Indian enterprises are gingerly experimenting with cloud computing, but analysts expect accelerated pace of adoption in the coming years as the new model offers lower costs and solves the challenge of software and hardware obsolescence. SBI uses Google’s cloud-based search services to scour through its massive repository of account and customer data. That may be, but Microsoft does not think Google has what it takes to win the enterprise clients. Analysts are not ready to call the game just yet but agree that the competition is definitely getting fierce. While Google used to be predominantly known for its search, advertising and its popular e-mail Gmail, Microsoft specialised in operating systems and office productivity applications. But things have changed now.